King Arthur (Bradlley Dean) and Merlyn (Herman Peters) begin the quest for right in the musical Camelot. All Photos by Diane Sobolewski. Guenevere (Erin Davie) Invites the Knights to Take Her to the Fair. 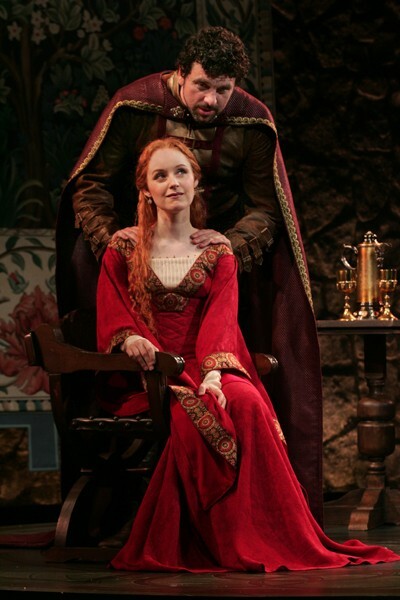 In Camelot, Bradley Dean is King Arthur and Erin Davie his Guenevere in the Goodspeed musical. A new order of chivalry and honor is established in Camelot. 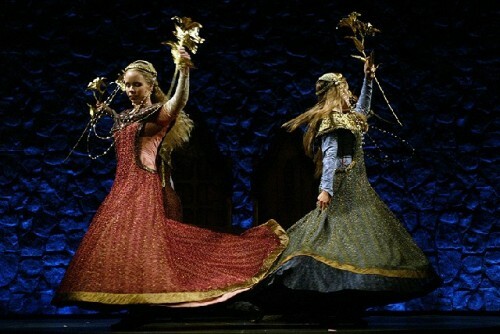 Marissa McGowan and Mollie Vogt-Welch in Goodspeed Musicals Camelot. Photo by Diane Sobolewski. As Mordred, Adam Shonkwiler’s Seven Deadly Virtues tickles wickedly in Goodspeed’s Camelot. All photos by Diane Sobolewski. 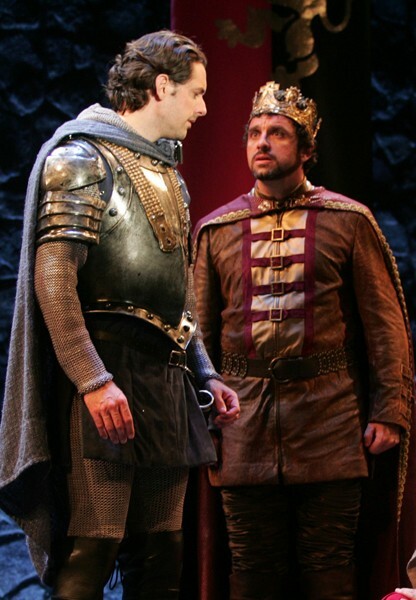 Loyalties are tested between Lancelot (Maxime de Toledo) and King Arthur (Bradley Dean) in Camelot at the Goodspeed. 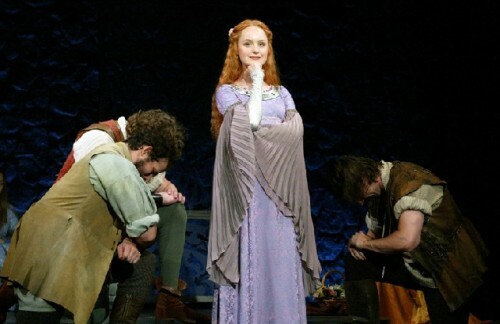 The cast of Camelot celebrates the lusty month of May. Diane Sobolewski photos. 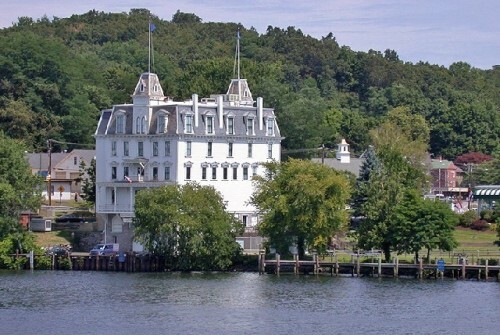 The Goodspeed Opera House in East Haddam is on the Connecticut River, with adjacent grounds and tables for guests to enjoy a pre-performance picnic. Erin Davies as Guenevere. Diane Sobolewski photo. Goodspeed Musicals presents Camelot, Book and Lyrics by Alan Jay Lerner, Music by Frederick Loewe, Directed by Rob Ruggiero, Music Director, Michael O'Flaherty; Choreographed by Ralph Perkins, Produced for Goodspeed Musicals by Michael P. Price, Scenery Design by Michael Schweikardt, Costume Design by Alejo Vietti, Lighting Design by Lohn Lasiter, Sound by Jay Hilton, Hair & Wig Design by Charles LaPointe, Orchestrations by Dan DeLange, Assistant Music Director, F. Wade Russo; Production Manager, R. Glen Grusmark; Production Stage Manager, Bradkey G. Spachman; Casting by Stuart Howard, Amy Schecter & Paul Hardt, SCS; Associate Producer, Bob Alwine; Line Producer, Donna Lynn Cooper Hilton. Cast: Arthur - Bradley Dean, Sir Dinadan - Alan Snyder, Merlyn Herman Petras, Guenevere - Marissa McGovern, Nimue - Rebecca Pitcher, Lancelot - Maxime de Toledo, Squire Dap - Matt Faucher, Pelinore - Ronn Carroll, Lady Anne - Mollie Vogt-Welch, Sir Sagramore - Steve French, Sir Lionel - Brandon Andrus, Mordred - Adam Shonkwiler, Sir Clarius - Michael Deleget, Sir Angus - Matthew C. Thompson, Tom of Warwick - Charles Everett Crocco. Ensemble: Brandon Andrus, Michael Deleget, Matt Faucher, Steve French, Andrew Hubacher, Marissa McGowan, Rachel Alexa Norman, Rebecca Pitcher, Rachel Rincione, Allan Snyder, Matthew C. Thompson, Mollie Vogt-Welch. Swings: Shawn Pennington, Amanda Salvatore. Orchestra: Conductor/Keyboard I - Michael O'Flaherty, Keyboard II - F. Wade Russo, Trumpet - Mark Slater, Trombone - Dave Kayser, Reeds - Liz Baker Smith, Violin - Karin Fagerburg, Harp - Susan Knapp-Thomas, Percussion - Salvatore Ranniello. Camelot, the legendary musical about King Arthur, the Knights of the Round Table, Sir Lancelot and Guenevere is a rarity in these parts. It's a fabled musical that gave the JFK Administration its name. It still packs a powerful punch as a lesson that right is as important as might. So we made the long trip to the Goodspeed Opera House in East Haddam, Connecticut to see it again. The music of Lerner and Loewe is as glorious as ever, and everything about this production from the singers and costumes to the glorious band in the pit sparkles. The live music also reminds us of the tremendous difference in sound between real trumpets, violins and harps and budget-cut editions with rehearsal pianos, or even worse, synthesizers. The current production began previews on July 10, officially opened August 5 and runs until September 19. That's some 80 performances all told, yet tickets can be hard to come by. The show is performed in a historic Victorian theater, built in 1876. Its intimacy is legendary, accommodating a miserly 398 people per performance. The high quality of Goodspeed productions is reliable and makes the long trip worthwhile. It is the only theater in the country that has won two Tony's just for existing, and has sent some sixteen musicals to Broadway - including Annie and Man of La Mancha. That's probably as many as all of the Berkshire companies combined. They began as a summer straw hat house doing only musicals, but their season has expanded to one that operates from April to December. Despite the small stage of the Goodspeed, this Camelot is as big in sound and energy as the 1960 original which I saw in Boston almost a half century ago. The production is directed by Rob Ruggiero, whose work used to be seen at Barrington Stage, but who is now in demand nationally. He is based in Hartford, and often works with TheatreWorks there. What he has done with a cast of 18 plus eight musicians is simply incredible. 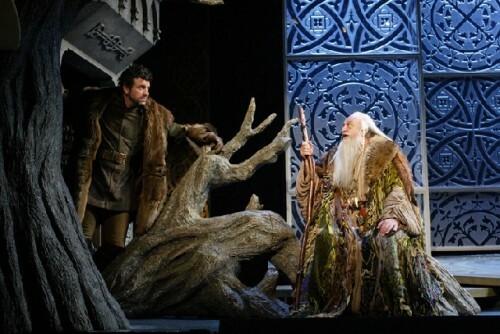 On a stage barely over 20' deep and not much wider, he has created the entire world of King Arthur and his court, the castles, the battlefields, and the intimate inner chambers in which the action takes place. This is done with great economy which is only obvious upon close examination. A series of simple screens slide in and out to signal scene changes while also serving as the main backdrop. Camelot has some of the most memorable - and hummable - music by the renowned team of Alan Jay Lerner and Frederick Loewe who also wrote My Fair Lady. Unfortunately, putting this show together drove the team apart. When the original director and book writer Moss Hart got ill, Loewe was asked by the producers to take up the gauntlet, but Lerner considered this a breach of partnership and never worked with him again. Which brings us to the book(s) of the show, which critics have called clunky and verbose. There are a lot of versions of it floating around, and each production has to choose anew. Goodspeed and Ruggiero chose well, their script has been well edited and parsed, though still a bit talky. The show runs a full three hours. With 20 songs and 15 scenes, it passes swiftly, and leaves you wishing it didn't have to end. The title song of "Camelot," is its signature, but so are "The Lusty Month of May," "I Loved You Once in Silence," and "What Do the Simple Folk Do." 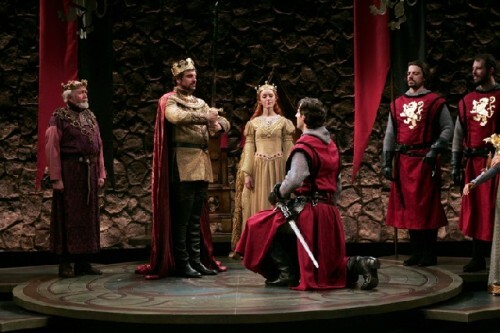 When I first saw Camelot in its pre-Braodway tryout at Boston's Colonial Theatre, it made an indelible impression that is still very much seared into my memory. So it is inevitable that comparisons to the original cast must be made in this review. Richard Burton played the original King Arthur, and it came as a great delight to find that Bradley Dean was easily his equal. Finding the right balance between Royal self-confidence and human self-doubt is not easy, but Dean had both. And his final scene in which he passes on the legend of Camelot to a boy who wants to be a Knight broke the hearts of many in the audience, mine included. 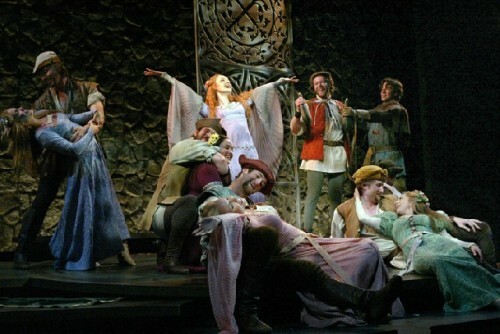 The evening I attended, the role of Guenevere had a substitution, so that instead of being perfomed by Erin Davie, it was sung and acted by the charming Marissa McGowan. Extracts of Davie's performance are available on the Goodspeed's website, and it is clear that I got the better deal. Davie's interpretation is haughty and overly theatrical, while McGowan got the young and future Queen's demeanor just right. Best of all, she sounded as solid and elegant as Julie Andrews who originated the role. No shame in that. As Sir Lancelot, Maxime de Toledo stood head and shoulders above the original Robert Goulet. Literally. This sturdy performer was impressive on every count, though his humanity had a bit of trouble seeping out in his somewhat cold, distant acting. Finally, the role of Mordred, the evil presence in Camelot, was well acted by Adam Shonkwiler, who quite frankly acted circles around the original Roddy McDowell. 50 years ago there were only a few ways evil was played, most everyone copied the Bela Lugosi-Roddy McDowell-Peter Lorre-Jimmy Cagney schools of malevolence. Today we can add Alan Rickman, Frank Langella and a host of other evil acting styles to the repertoire. 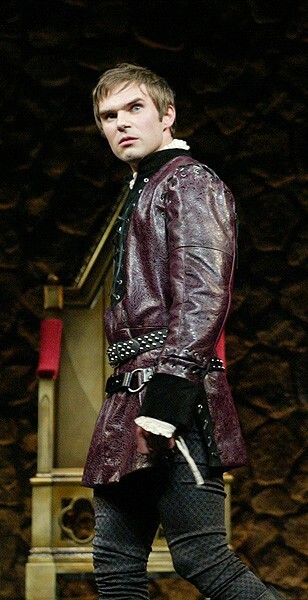 As the current Mordred, Adam Shonkwiler chose his own unique interpretation, turning his character into someone it was an absolute pleasure to dislike. Along with Marissa McGowan, he was one of the two great discoveries of this show. As a director, Rob Ruggiero inherited the great limitations inherent in the Goodspeed space. There is only 8' of wing space, and a good part of the stage is actually an apron which was built out from the original proscenium. That extension incorporated the boxes closest to the stage which are still visible, albeit somewhat disguised. The stage was originally 12' deep, but with the apron it is almost 21' now, still a very modest space. But by dividing the stage into what appears to be three zones, and placing entrances and choral elements in the auditorium itself, it grew into a much larger stage in the audience's mind. The vertical elements were also enhanced with both platforms and by having the actors climb, stand, sit, and kneel during the proceedings. I can not think of a single theatrical trick Ruggiero failed to use to keep things moving. Bravo. Of course the lighting and sound design also helped establish the feeling of space. John Lasiter and Jay Hilton did their jobs with great expertise. The costumes designed by Alejo Vietti deserve their own special mention, as a glance at the photos accompanying this review will prove. Gorgeous and well done. Finally, the whole point of this trip was to hear a musical with real music. The eight musicians in the pit were breathtaking, led by Music Director Michael O'Flaherty. The orchestrations by Dan DeLange were astoundingly full and rich, and the instrumental elements of the production were at least as responsible for its success as any other element. The percussion effects, the shimmer of a trumpet, the aching soulfulness of a violin, the wistful call of a reed and the ethereal sparkles of a harp can never be equaled by a piano, no matter how well played. So pack up a picnic supper, hop in the car, and wend your way south to the Goodspeed for Camelot. Enjoy the picnic tables on the banks of the Connecticut River before you head inside for what is unquestionably our region's best musical of the Summer, possibly even the year. It is not to be missed.